Substrate Plain gravel or sand, but continued growth boosted by nutrient substrate. Comments These plants may send stems shooting to the surface very rapidly if fertilised. 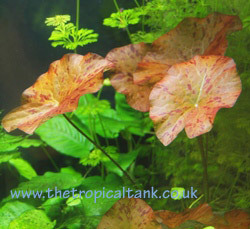 Colour can be very variable with predominantly red or green leaves produced by the same plant. Cultured red varieties may be sold as Nymphaea lotus var Rubra or Red Tiger Lotus. Nymphaea stellata is a similar species with smaller spade-shaped leaves that may be sold under the same common names.